Ticketmaster has a new challenger in Canada. U.S. ticketing platform Ticketfly today entered its first international market by striking a deal with Canada’s largest independent concert promotion company Union Events, and acquiring Canadian ticketer Prime Box Office. Ticketfly’s CEO and co-founder tells me the moves will bring lower service fees and better tech to Canadian ticket buying. 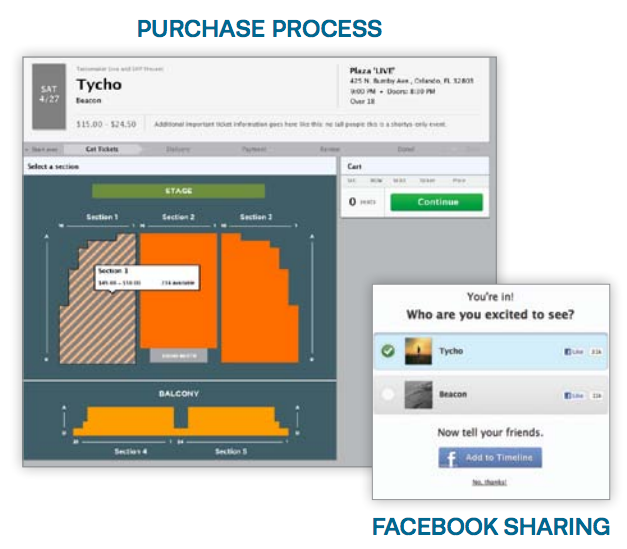 Ticketfly’s platform provides venues and concert promoters with a stable platform for selling tickets that can handle huge traffic spikes when popular shows go on sale. It also lets them cheaply market their shows on multiple social networks simultaneously and monitor analytics to make sure their concerts sell out. The startup was co-founded by Dreskin who previously started TicketWeb, built it into a serious U.S. player, and then sold it to Ticketmaster. Now he’s back at it with Ticketfly, and is relying on efficient software to go head to head with his old employer. Ticketfly grew its total funding to $37 million by recently raising a $22 million Series C to enter the sports ticketing market, prep for an IPO, and pay for its expansion beyond the United States. Handling ticketing for Union Events, one of the world’s top 50 concert promoters and the largest independently-owned one in Canada, will certainly get Ticketfly’s foot in the door. The Calgary-headquartered company has a solid presence in the rock and dance music scenes. Ticketfly has also partnered with another promoter, Toronto’s Collective Concerts, who handles all of top Canuck band Arcade Fire’s Canadian shows. To bolster its connections with venues in Canada, Ticketfly also acquired regional Calgary ticketing company Prime Box Office. Its president Greg Stephenson is now Ticketfly’s director of sales for Alberta. Also joining the Ticketfly team is Bruce Morrison, former head of sales for prestigious Toronto venue the Sony Centre For The Performing Arts. Despite Canada being a highly wired nation active on social networks who will buy and share tickets online, Ticketfly has a tough road ahead. Dreskin admits Ticketmaster is a “well-entrenched incumbent competitor.” He says convincing venues to go with Ticketfly’s software which he considers more modern and flexible “will be a process of education.” Ticketmaster’s long venue contracts and connections to musicians through Live Nation Entertainment who it merged with 2010 make it hard to disrupt.